The latest innoFADER with a streamlined installation system. The crossfader is at the very heart of the DJing experience. So why do so many mixers come with faders that feel like an afterthought? The feel of the crossfader is as important as any other feature of your mixer, so you deserve to have the best at your fingertips. The Audio Innovate innoFADER PNP has been designed to completely change the way you feel about the crossfader. Having studied the habits and requirements of today’s DJs, the innoFADER PNP offers unparalleled levels of quality and adjustability that you just don’t find in other crossfaders. 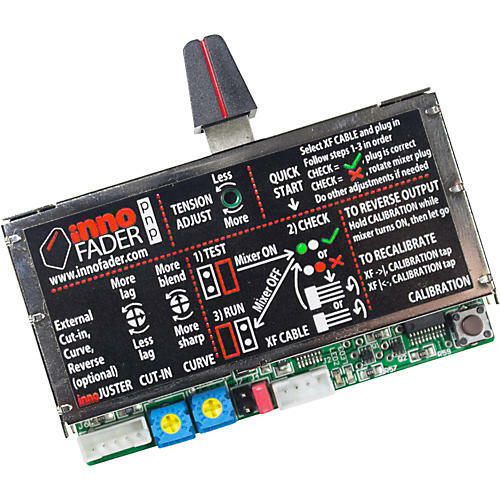 Different from the original innoFADER, the innoFADER PNP loses the bulky adapter boards and streamlines the installation process with cable adapters that are easily interchangeable to match your model mixer. Buy the innoFADER PNP today and change your DJ life forever!